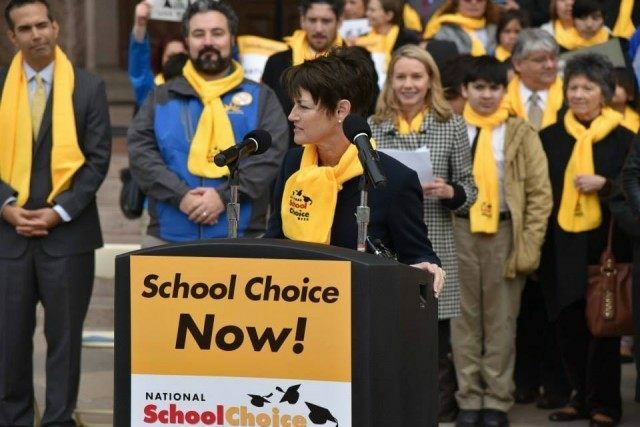 Supporters of school choice gathered at the Texas Capitol on Friday to send a message to Legislators: they want education reform, and they want it now. A bustling, diverse crowd of students, parents, teachers, elected officials and other reform advocates — and even a marching band — enjoyed a festive atmosphere as they listened to speeches, sang and danced, and then lined up to enter the Capitol to take their message directly to their elected representatives. Breitbart Texas was at the scene, and spoke to a number of the enthusiastic attendees of the rally. Laura Colangelo, Executive Director of the Texas Private Schools Association (TPSA), echoed the Steinhausers’ joy at the large crowd. “The amazing turnout proves there is incredible support for school choice in Texas,” said Colangelo, “and it’s time to take advantage of that.” Colangelo told Breitbart Texas that the TPSA was glad to see Representative Dwayne Bohac (R-Houston) had just filed HB 1043, a tax credit scholarship bill, this week. Families Empowered Communications Director Rachel Dempsey told Breitbart Texas her group had organized two buses, one from Houston, and one from San Antonio. “We’re helping bring the families to the table for this discussion,” said Dempsey, explaining they advocate for a broad range of school choice options, whether it may be private school vouchers, transfers to different public schools, charter schools, home schooling, and so on. Americans for Prosperity – Texas Policy Director Peggy Venable said that the great turnout was “just a fraction of the parents who are demanding the right to choose their children’s schools.” Venable told Breitbart Texas that the demand for educational options was so high, the wait list for Texas’ charter schools was over 100,000. Lieutenant Governor Dan Patrick, a vocal support of school choice, could not attend the rally, but had sent his best wishes. Patrick “has been fighting for us every step of the way,” said Steinhauser as the crowd cheered. State Senator Donna Campbell (R-New Braunfels), known for being a school choice champion in the Legislature, then took the podium. Breitbart Texas spoke with Campbell after the rally, and she said that she had felt that it was important to be there and to speak because on the issue of school choice, “because it’s an issue that can truly make a difference for the children’s future in Texas.” Campbell added, “I’m elected by the people, I work for the people, and it’s my job to do what’s going to be best for the future of Texas and our children.” Campbell filed a bill this week, SB 276, establishing a taxpayer savings grant program, and is expected to support several other school choice bills filed by other lawmakers. After his remarks, Breitbart Texas briefly interviewed Bush to ask for more information about how his office could help school choice efforts. One key way, said Bush, was through the Permanent School Fund (PSF), which he manages. The PSF can serve as a bond guaranty program, both for public school districts and for charters, he said. Bush referred to the PSF as a “liquidity backstop,” and explained how school districts with less-than-stellar credit ratings could use the backing of the PSF. School choice advocates at the rally said over and over again that it is about the students, and one student from a public charter school in San Antonio summed up well what advantages he has gained from having options for his education. Nicodimus Martinez, a senior at the Brooks Academy of Science and Engineering, told Breitbart Texas that his parents had sent him to a Catholic elementary school, but there was no such option in his neighborhood for middle or high school. In San Antonio, the “residential differences are stark,” said Martinez, and the school where he was districted did not offer the advanced STEM (science, technology, engineering, and mathematics) classes that he wanted to study. More videos from the National School Choice Week Rally can be viewed here, courtesy of Adam Cahn.